Islamabad, October 20; The Prime Minister of Pakistan’s Office (PMO) representatives briefed PILDAT’s Governance Assessment Group on the Federal Government’s performance on key governance indicators in its second year in office from June 2014 to May 2015. 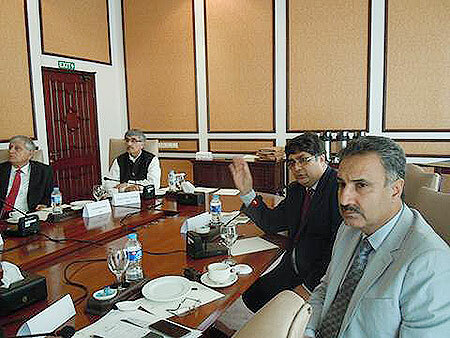 Additional Secretary to the Prime Minister, Mr. Fawad Hasan Fawad, leading the delegation from the PMO, was accompanied by the Joint Secretary, Mr. Kazim Niaz, and the Deputy Secretary, Prime Minister’s Office, Mr. Khushal Khan, to share the details of the initiatives undertaken by the Government. The briefing was part of PILDAT initiative to assess Quality of Governance in Pakistan through which PILDAT seeks and receives data on key governance indicators from the Federal and 4 Provincial Governments annually. In similar briefings earlier from October 01-02, 2015, representatives from 4 Provincial Governments shared highlights of their respective Governments’ Performance through June 2014-May 2015 with the Governance Assessment Group. Members of PILDAT’s Governance Assessment Group who joined the meeting included Former Chief Secretary of Balochistan, Mr. Abdul Hakim Baluch, Senior Lawyer, Former Chairman SECP, Dr. Tariq Hassan, Former Chief Secretary Sindh, Mr. Javed Ashraf Husain, Former Senior National Specialist (Education), UNESCO, Mr. Arshad Saeed Khan, Former Caretaker Chief Minister KP, Former Chairman WAPDA, Mr. Shamsul Mulk, Development and Political Economist, Senior Fellow UC Berkley, Dr. Niaz Murtaza, Senior Journalist, Mr. Ghazi Salahuddin, Editor in Chief, Daily Pakistan, Mr. Mujib ur Rehman Shami, Chairman IPPAC, Former Chairman FBR, Mr. Abdullah Yusuf, and President PILDAT, Mr. Ahmed Bilal Mehboob.